For the past few years, I've been living a childhood dream. Driving a truck all over this country has provided me with one of the most unique lifestyles that I can think of. It has been overwhelmingly positive and I'm grateful for everything I've been able to experience along this wonderful journey. But I've recently had some very exciting opportunities become available to me that I simply can't pass up. And so, my final run as a truck driver has been completed. Luckily, this opportunity allows me to still be involved in the trucking industry in a big way! When I first got into trucking, Brett (the owner of this site) asked me if I'd like to blog about my experiences. I jumped at the opportunity as I love to write and thought it would be helpful for people just getting into the industry to read about the trucking life. I immediately enjoyed it and thought it was cool that literally hundreds of people every single day were reading what I had to say. Who knew I was so interesting!? I finally thought about building my own websites on a part-time basis. Problem was, I didn't know the first thing about building a website. Brett had always taken care of everything as far as my blog was concerned. So I decided to start learning as much as I possibly could and immediately I was hooked. While sitting at shippers and receivers, during my 34hr restarts, and even during my 10hr breaks, I was working on my websites and learning all I could about how to make a living online. Slowly but surely, I started to grow and my websites became more and more successful. I finally reached a breaking point. I could either keep my sites at the same level or take a risk and focus on them full time. The decision was very hard for me to make, but I decided to take the risk and try my hand at becoming a full time web programmer. Since there is some risk to what I'm doing, I knew I had to leave my trucking job on good terms. I informed my dispatcher 2 weeks before the day I wanted to quit and was honest with him. I let him know exactly what I was doing and that I wanted to leave on good terms just in case this doesn't work out. He was sad to see me go, but said the door is always open if I want to come back. That's one of the great things about having a CDL - it's a great insurance policy! Trucking companies are always hiring. So I ran for two weeks then turned in my truck. It was a bittersweet day. I'm so excited about my new venture, but I'm also going to miss the trucking lifestyle dearly. An Unexpected Twist - And A Partnership With TruckingTruth! After some discussion, Brett and I have decided to team up and work as hard as we can on improving this already great site. The growth over the past few years has been explosive, but we feel we can make things even better. And now that there's two of us, the site will grow and improve by an even quicker pace. Both Brett and I are passionate about what we do and we understand the pains you all face out on the road. A big complaint from truckers is that nobody cares about them. Well, we do. The things that are coming in the near future will blow you away, no matter what stage of truck driving you're in. 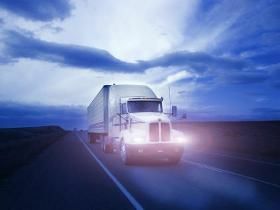 There are very few people that have the knowledge of trucking and the programming skills to build content, cell phone apps, and online programs to help truck drivers. It may sound melodramatic, but we're about to change the way truckers do business. Two former truck drivers turned programmers working for you with a passion and desire to help that can't be match by even the biggest corporations. These next few years will be very exciting and I hope you check back often to see what we're building for you! So while my life as a trucker has come to a close, I will still be involved with this website (more than ever, actually) and will be working hard to improve the lives of truckers nationwide. Great things are coming and no doubt, if you're a trucker, you'll be directly impacted by the wonderful things that are on the way. Of course, if you ever would like to contact me personally, please don't ever hesitate to send an email to TruckerMike@TruckingTruth.com. I love to help! That's why I'm here! So until next time, drive safely!